FREE return shipping by way of UPS Ground within the Contiguous 48 United States (Additional shipping charges apply for Alaska and Hawaii). BY ADDING THIS ITEM TO THE CART, YOU ARE ACKNOWLEDGING THAT YOU HAVE READ, UNDERSTAND, AND AGREE TO OUR TERMS AND CONDITIONS POLICY. We can only return tools with the factory specified safety features installed and in operational order. Any missing safety features will be installed on tools before return shipment. You will be charged for the installation of missing safety features so please make certain they are installed before shipping us the tool(s). If the tool is received in a condition that requires parts and repair service over the amount of $140.00, dependent upon tool received, an estimate will be provided prior to making any repairs. If you decline to have the tool repaired, the service fee of $140.00 covering diagnostic time and shipping will NOT be refunded and the tool will be returned to you. In the event you choose not to have the tool repaired, you may elect to have the service fee applied towards the purchase price of a refurbished tool of the same or similar model pending availability. If you elect this option, the purchase of the refurbished tool must be made within 48 hours of declining tool service. 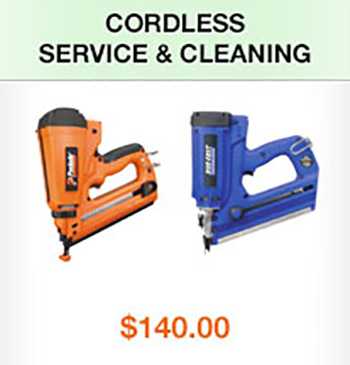 If you elect to purchase a refurbished tool, your original tool becomes property of ITW Construction Service & Parts.